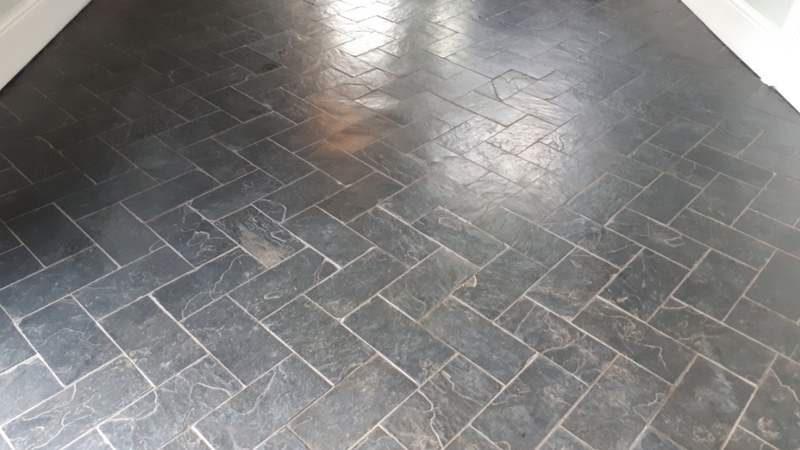 A client contacted me regarding their slate tiled floor which had only been down a few years and was now looking dull and uninviting. 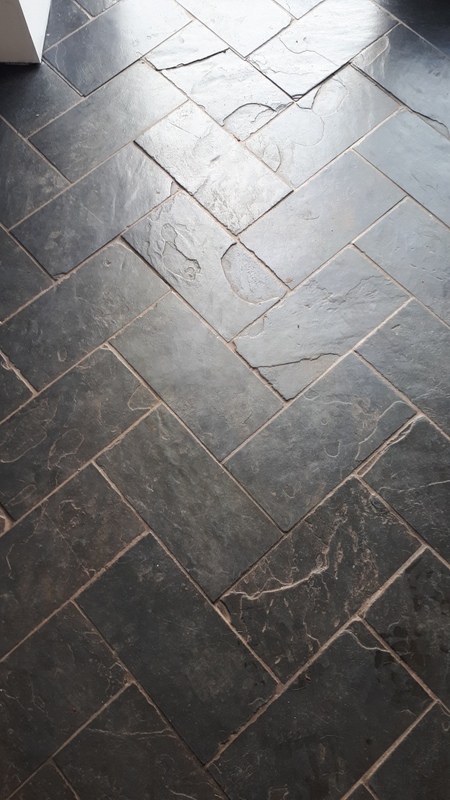 The slate tiles were laid in a herringbone pattern and Interestingly they had only been cleaned and sealed about a year ago by another company, but it has soon started to look dull again. 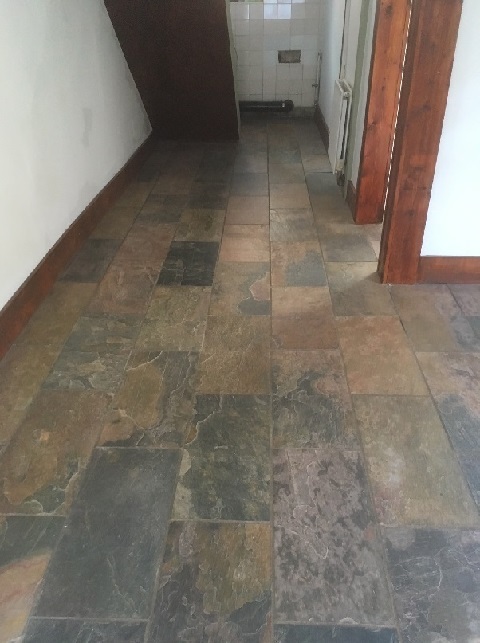 Naturally my client was disappointed with the result, especially considering how new the floor was. The property was in the Birmingham suburb of Moseley and as per usual I paid them a visit to survey the floor and conduct a test clean. From what I could see the sealer the previous company had used was already failing and wearing off, this left the stone vulnerable allowing dirt to become ingrained in the stone. We discussed the overall procedure and I completed a test clean on part of the floor which went well so the customer was happy to proceed. 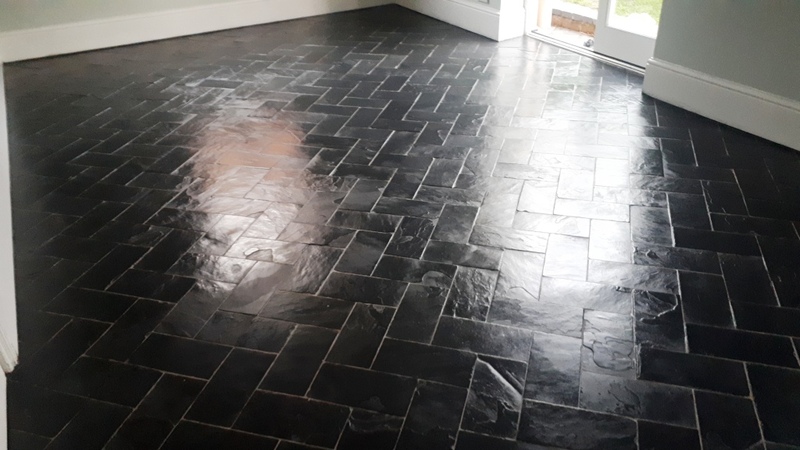 Whilst I was there, we also discussed the effects of different sealers I would recommend for the tiles so they could select one that would give them the look they wanted. On the first day I applied a strong solution of Tile Doctor Pro-Clean combined with Tile Doctor Remove and Go, this was left to dwell on the slate while I cleaned up the grout with a stiff grout brush. I used this combination of products to ensure I stripped any coatings that may have been applied to the floor by the previous company and the original installer. 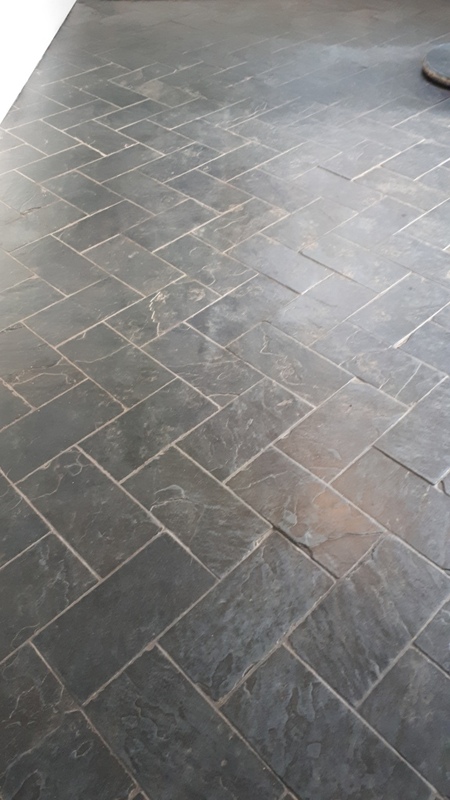 With the grout scrubbed I turned my attention to the Slate tiles by scrubbing them with a black pad fitted to a weighted rotary buffer machine. The floor was then rinsed thoroughly, and the now soiled cleaning solution extracted with a wet vacuum. The kitchen area was quite large, so I did the clearing in three section inspecting each section afterwards before moving onto the next. There were some areas where the existing sealer was proving stubborn to remove which were re-treated until clean. 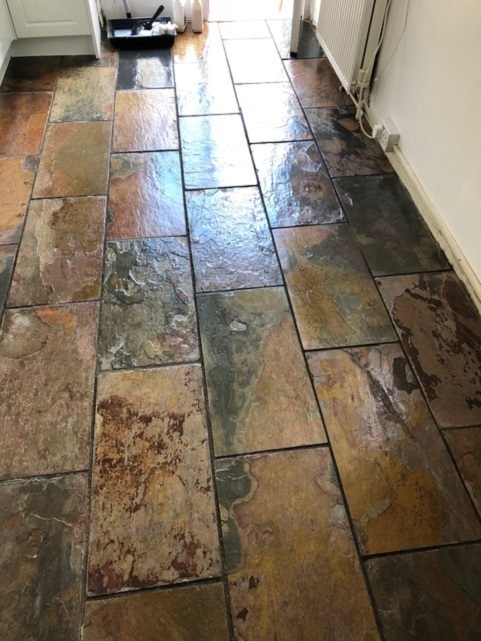 I discussed this with the customer who explained that the previous company had left a tin of sealer and advised them that they should clean the floor and then apply more sealer. This meant every time they did, they were adding another coat of seal and if the cleaning was not effective it would result in trapping dirt under the sealer! After spending most of the day cleaning, it was agreed to let the floor dry out and see how it looked next day. 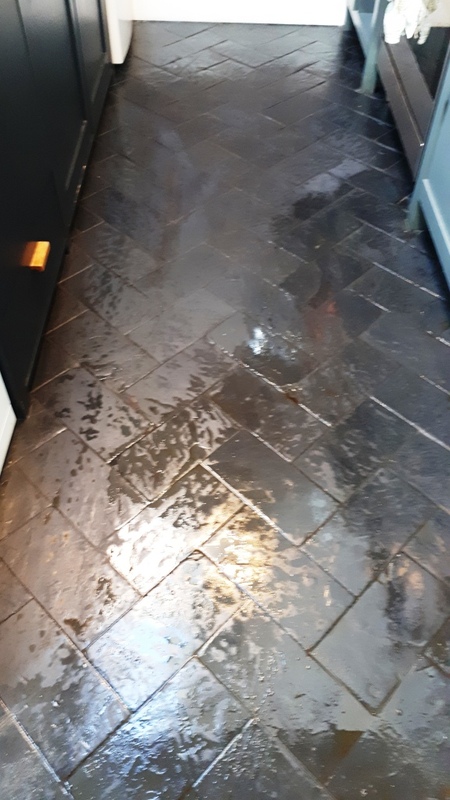 When I returned on the second day, I could see there were still traces of sealer on some areas of stone and grout, so I decided to clean the floor again with more Pro-Clean but this time working in in with an abrasive 400-grit burnishing pad. This did the trick on the slate, but the grout needed a handheld diamond block to remove the seal. The whole floor was then rinsed and allowed to dry. Although previously we had discussed the different options for sealing the client wasn’t sure which one to choose. To help them decide I dried some of the tiles with a heat gun and applied different sealers to they could see the different between the matt and sheen finishes. 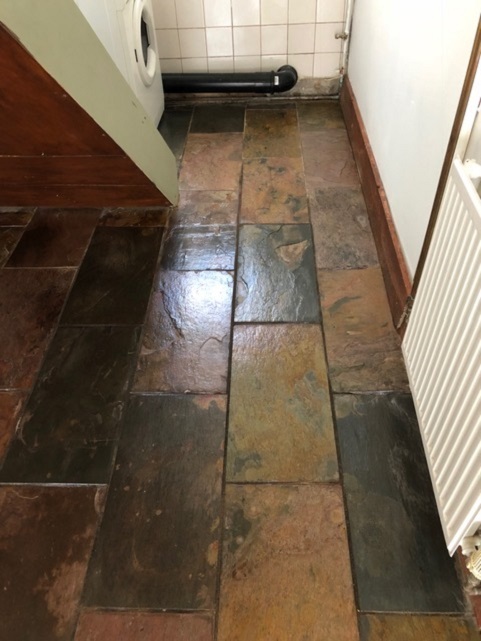 The client decided on Tile Doctor Seal & Go Extra which helps bring the colour out in the tiles, it’s also breathable and has a nice sheen to it but slightly less so than Tile Doctor Seal & Go. I applied four coats as soon as the floor had dried. 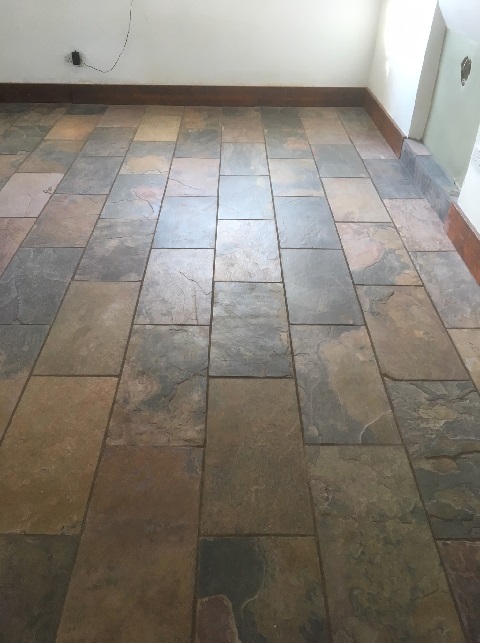 I left the client with a bottle of Tile Doctor Neutral Tile Cleaner to help maintain the tiles appearance. 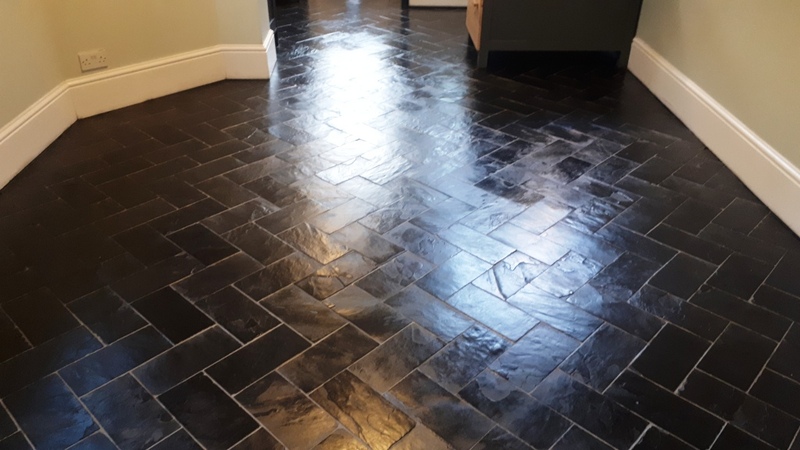 The client was very happy with the results, thanked me for my hard work and commented that the floor looked better than the day it went down.